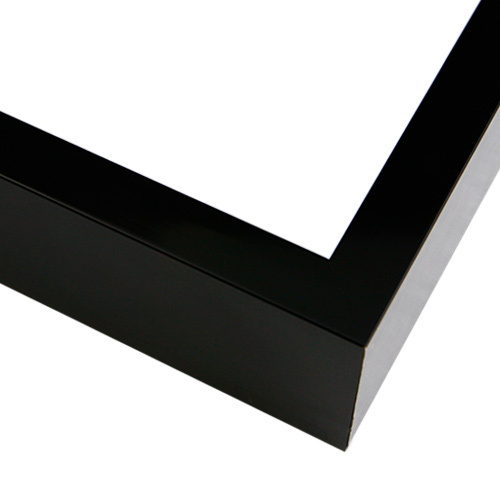 This elegant matte black picture frame has a contemporary, square shape with a crosshatched surface. The narrow metal picture frame looks stunning with mats to elevate your favorite family portraits, photos, posters, drawings or Instagram snaps in your living room or office. Customize your size up to 1/8th of an inch! Exceptional quality + value price. Your art. Your way. Every day. Pictureframes.com. The frames are high quality. The pictures look great. Nice frame; very simple and elegant. It is easy to put together if you ignore the instructions and just look at it to see what makes sense. Thank you so much for your review, funny enough we are in the process of redoing our instructions and you should be seeing those soon! Poster as a Christmas gift by one of the my favorite illustrators is finally hanging above the fireplace in The Keeping Room, or den. Measurements were precise; quality excellent. It was necessary to bring up a video on youtube for a visual of constructing frame which was excellent. If your company offers videos online, it would be helpful if that information were included in the packaging. This frame is simple, modern, and gallery appropriate. It doesn't overpower the artwork. Excellent quality and presents clean and contemporary. Additional depth enhances the impact on a large wall. Highly recommend. Size, apparent quality, gripper edge. Looked great with a particular poster for my son’s room! This frame meets my size and color needs! BEST ANSWER: Hello. Our production time is 3 days, however, by adding Express the production time is 48 hour. Thank you for your inquiry. Is this for a canvas mount. A floating frame? BEST ANSWER: Hello! The frame has the rabbet/depth of 13/16" which will support a canvas within that depth. This beautiful frame is NOT a floater frame. Thanks! Is ok to use glass with your metal frames? BEST ANSWER: Hello! Yes indeed, you can use glass with metal frames. Thank you for your inquiry!